An epic conclusion to an incredible series that did not disappoint. Aleatha Romig’s masterful storytelling kept me biting my nails and furiously flipping the pages to finally get to the emotional, jaw-dropping conclusion. WHAT A WILD RIDE! Suspense. Mystery. Emotion. Romance. Tragedy. Elation. Devastation. Did I mention nail-biting anxiety?! This final installment in Claire and Tony’s story had it all. The story crept through me, gripping me, holding me captive at the precarious edge of sanity. I felt seriously obsessed and consumed with trying to discern the whole game, seeing how each opponent played, anticipating the next surreptitious move. This clever, duplicitous cast of characters all had a story to tell, a plan in mind, a past that fueled their motivation. This story — this game — was one that shifted constantly beneath me. The entire book is a story told in parts, through various eyes and at different time periods. I thought the structure and format of the book was ingenious… it was a way to keep us in suspense, never seeing too much of the game at once. The story unfurled slowly, in ribbons of information that weaved together and twisted in ways that so many times I didn’t see coming. Chapter 1 blew. my. mind. Shook me to the core. I kept wondering WHAT?! Did I miss something?! OHMYGOD!!! WAIT… WHAT?! (Add in some expletives and that was pretty much the way it went, folks). Aleatha Romig’s mastery of setting up surprise and manipulating suspense was clearly evident as she worked to reset our assumptions from the get-go. The end game was not indeed clear at all. Harry, Meredith, Claire, Tony, Phil, Emily, Catherine and so many others were pawns of their past, gambits carefully orchestrated as a result of their own personal convictions. Whether the ultimate prize was love, a happily ever after, a solved case, money or power, everything was connected. While Consequences and Truth packed a lot of emotional intensity throughout, I felt the first half of the book was filled with intensity of a different kind. It was about investigation and observation, trying to put all the pieces together. Admittedly I missed a little of that emotion-fueled angst, but I was captivated nonetheless. When Claire left Iowa and we found her on the island with ****, so much was set into motion. But this time, Claire took control and was determined to succeed. No more mistakes. No more trusting the wrong people. It was really intriguing to see how Claire was evolving. To me, she has always been such an interesting character… a mix of vulnerability, naivety and staunch determination. Over time, and as a result of so many consequences, her resolve steeled and her confidence grew. Phil (who is one of my favorite characters in the book), pushed her to listen to her gut and follow her instincts. The concept of power and control was a critical element for me. It was almost like a character all its own, it was that significant in my eyes. Claire needed to find herself, find her confidence and find the control she desperately yearned for in order to survive, while at the same time, simultaneously find the wisdom to know when to wield it and when to relinquish it to someone else. For Tony, control was a part of his DNA, but in order to show Claire he had truly changed, that they were partners, he had to share control and share decision making. I loved that Tony evolved and transformed into a man that was ultimately not defined by his past transgressions, but even more so that he remained true to the person he was. He was a man made better, a man who learned to feel, a man who let love in, but a man that was undeniably Tony through and through, even at the end. Tony is a man who despite relinquishing control, struggled in that surrender, as we would expect him to. Despite what you think of Tony from past books, you will admire the depth of his love and determination to make things right with Claire, with their situation and even with his past. The hopeless romantic in me relished in the ways Tony expressed himself to Claire. I was absolutely, irrevocably convinced that the love he felt for her was true and right. No questions. Claire struggles. She desperately desires their happily ever after, but she’s afraid to learn all the truths. Would it change her feelings for Tony? Could she handle it? Could she survive it? Would learning the truth have irreversible consequences? But perhaps the old adage of fearing fear itself is true… does the unknown fuel our thoughts to leap to places so dark, so scary that in actuality don’t exist? I felt that through what happens in the story, and through the truths that are revealed, I intrinsically understood both Tony and Claire so much better. Claire keeps these really intimate journals, her compartmentalized thoughts freed on paper, which not only evoked so much emotion, but which also helped shed understanding on the journey she took from prisoner to lover to soul mate. Claire and Tony are two twisted souls, as is Catherine as well, that are held captive by their past, downtrodden by their guilt and uncertain of their ability and worthiness to find redemption and happiness. And as for Tony, for me it’s not about loving or hating him in the end, it’s about accepting who he is, who he has become and in the end, seeing the true meaning in his final act of sacrifice and selflessness. Their relationship certainly started in the depths of darkness, and it may not be considered normal… but they are right for each other. As usual, expect so much to transpire as Catherine’s final play hits the table. The last 15 to 20% of the book is absolutely amazing and incredibly suspenseful. What can you expect out of this book? Aleatha’s crisp yet emotionally-charged writing and masterful storytelling for sure. Expect more twists, more consequences and more truth as the character’s convictions drive the final plays in this twisted game. This continues to be one of my favorite all-time series… I’ve loved each book! Although this is Claire and Tony’s final story, Aleatha Romig is working on three reading companions (novellas), the first, Behind His Eyes, will be told through Tony’s POV. No release date yet. 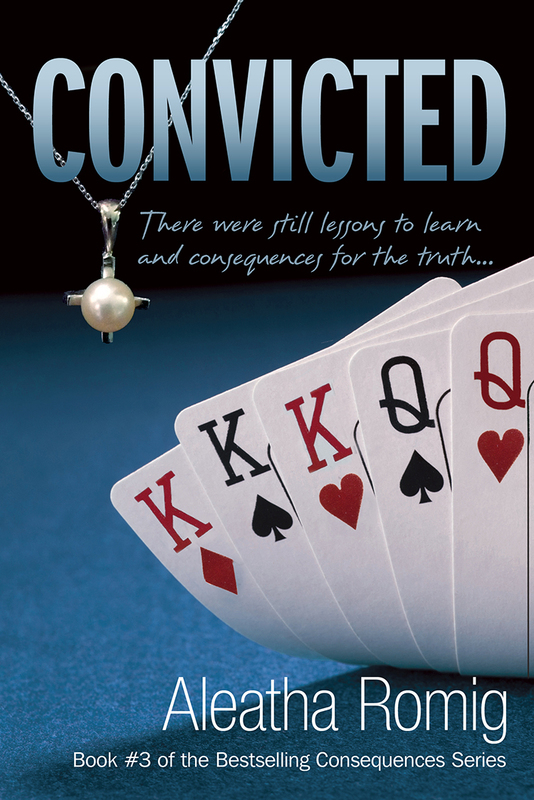 If you’ve already read CONVICTED and want to read some character interviews, click here. Thank you for the giveaway! 🙂 Love the series!! Reading Convicted right now… On the edge of my seat… couch.. front porch.. car seat.. You get the picture, my kindle is going everywhere with me as I read book no. three. My favorite series <3 <3 <3. I loved Claire, Tony, Nichol, Phil, Meredith, Courtney & Brent. My favorite scene was Claire giving birth! Tony changed in a way I never thought possible. I'm having a huge book hungover!